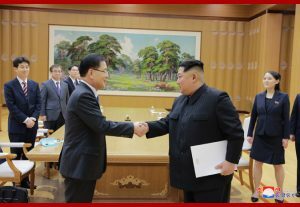 After eleven years without any top level contact between South and North Korea, the second such exchange has taken place this year when a South Korean delegation visited Pyongyang and was able to meet the North Korean leader Kim Jong Un. It returned with plans for a summit meeting at Panmunjom—a neutral place—in April and even the promise of a moratorium on nuclear and missile testing under certain conditions. How was that possible, and what could be the implications? It is important to note that the meeting itself was in many ways unexpected. True, Kim Jong Un in his New Year’s speech did offer steps towards inter-Korean reconciliation, but that sounded very familiar and was accordingly dismissed by many observers as just the usual “charm offensive” propaganda. It turned out, however, that the Pyeongchang Olympics served as an important facilitator to break the long-lasting impasse in inter-Korean relations. Seoul’s motivation for the current dialogue is relatively obvious. President Moon wanted and needed peaceful games. Given the tension on the Peninsula over the past year, Pyongyang could have conceivably acted as a spoiler. This danger had to be averted. We should also recall that one of the reasons why Moon Jae-in was elected as the new president in 2017 was the desire by a majority of South Koreans to improve relations with the North and avoid war. As a leader in a democracy, he has to deliver on promises and expectations. What we do not yet fully understand is the reason why the North Korean side went beyond announcements and offers to actually sending a high-level delegation to Pyeongchang. This was not just a working-level team, as was the case in the 2015 Asian Games in Incheon, but a group consisting of the nominal Head of State (Kim Yong Nam) and, most strikingly, the trusted sister of the leader (Kim Yo Jong). President Trump was quick to tweet that it was an effect of his own policy and the latest sanctions. This is not impossible, but there are other potential drivers as well. Among them is that the North Korean declaration of victory in the nuclear weapons part of the byungjin policy (of dual economic and nuclear weapons development) was genuine, no matter how realistic such an assessment would be. Having thus secured national security and acquired a position of strength, the next logical step would be to reach out to adversaries and to seek talks and cooperation. One would have expected the extension of an olive branch to Washington first, but either this yielded no result, or Seoul was singled out as the easier target. Another option would be that South Korea’s cooperative and active response to the New Year’s message has worked as a pull-factor for Pyongyang. No matter whom we credit with the current dialogue, the first results are here. Talks between the two Koreas have been held, and they will likely continue for the time being. The journey to South Korea by Kim Yo Jong and Kim Yong Nam and the meeting with President Moon have taken place. This was quickly reciprocated with a visit of Seoul officials to Pyongyang and a meeting with Chairman Kim Jong Un. Letters were exchanged. The North Korean leader, who has so far not been very active in meeting non-North Koreans, even invited the First Lady to join the official dinner, adding a state visit-like atmosphere to the inter-Korean exchange. A third inter-Korean summit has been scheduled; the venue is not South Korea, but it is also not Pyongyang again. The choice of Panmunjom shows that both were willing to compromise and were successful in finding a mutually face-saving solution. But where can all this lead to? Conventional wisdom would suggest that there are very clear limits that will be reached sooner rather than later. The North Koreans might be willing to stop testing for a while, but they are not going to give up their nuclear weapons altogether anytime soon. The US is not simply going to withdraw its troops from Korea, cancel its military exercises, denuclearize itself and lift all the sanctions. Against this background, despite all its good intentions, South Korea is unable to do anything that would violate international sanctions, even to keep making progress on the inter-Korean agenda. Or is it? This is the most interesting question. The whole idea of a dead end situation depends on the assumption that consent and cooperation by Washington is an essential part of everybody’s calculations. So far, this is certainly true, but the world is turning. China has been rising for many years now. As result of its massive gains in economic, military and political power, Beijing is becoming more assertive in international politics. The South China Sea conflict, the Belt and Road Initiative, and even the recent constitutional change to extend the rule of Xi Jinping are indicators of that. I have for a long time expected a situation when the Chinese are ready for an open challenge to the supremacy of the United States, thus ending the phase of a unipolar world order that started with the demise of the Soviet Union around 1990. I call it the Cold War 2.0, and it will certainly start in China’s own backyard: East Asia. I thought such a development would take at least ten more years to materialize, however. Is this what we are witnessing now, thanks in part to Donald Trump who is acting as a catalyst of such a process by pulling the plug on TPP, expanding THAAD, demanding higher payment for US military presence, and offending his allies with the threat of punitive trade measures? We should keep our eyes open for signs from Beijing. If this is where the game is headed, Chinese influence could play a critical role in changing the outcome of inter-Korean dialogue. For instance, imagine a scenario where Beijing is trying to capitalize on the current momentum and is ready to stand up to the United States, rather than continuing cooperation in a maximum pressure approach. In that case, it could declare after the upcoming April summit that the current inter-Korean dialogue has created important results, and that these show the international sanctions, at least those to which China has agreed, have fulfilled their task and have now become unnecessary. North Korea would be displayed by the Chinese as a country that is still problematic, but one that has shown willingness to cooperate and thus needs to be rewarded for such positive behavior in the name of peace and prosperity. Beijing could, for instance, submit a resolution to the UN Security Council to lift some of the sanctions, especially those targeting commercial sectors. Such a step would be vetoed by the US and most likely also by the UK and France. China may then declare that it no longer feels bound by previous resolutions and would unilaterally open its markets again for North Korean goods and services, and host those who want to engage in trade and financial transactions with that country. Russia would likely follow suit. Under such circumstances, South Korea would then have a choice: It could side with the United States and the UNSC, and refrain from re-opening the Kaesong Industrial Zone, resuming trade and other forms of economic exchange. Alternatively, however, Seoul could share Beijing’s position and feel free to do whatever they see is in the national interest of Korea. Washington would use all its economic and political power to prevent that, but under certain conditions, the costs of offending the United States will be offset by the benefit of facing a particularly friendly China. South Korea’s economic survival depends on the fate of Samsung and Hyundai. Who is, and who will be, the most potent and willing partner to ensure that? Is China’s relevance for South Korea’s economy already big enough to outweigh the many gains from the long-standing alliance with the US? How the latest instance of inter-Korean rapprochement proceeds will provide observers with clues to determine where the involved parties actually stand in the above scenario. One option is that Seoul will at some point stop its cooperative efforts towards North Korea to prevent a collision with existing sanctions, and Beijing will remain silent. That means we will be back to an unpleasant normal with more North Korean nuclear and missile tests, US military maneuvers, and mutual threats and accusations. Or this might just be the beginning of the end of the post-1990 world order. If true, this would require a complete rethinking of what we regarded as certainties, including such big issues as the US presence on the Korean peninsula, the status of Taiwan, and in a more distant future, the possible prospect of a Korean unification with Chinese backing. What the US does next will have long-term implications for the role it will play in Asia’s future. To maintain influence, the US should be smart, capture the current process and take a more active stake in dialogue with North Korea, rather than being the only party to remain seated ostentatiously while everybody else is cheering the joint North-South team.